The volatility of the stock market in 2016 has left some people looking for an alternative investment strategy, including real estate. 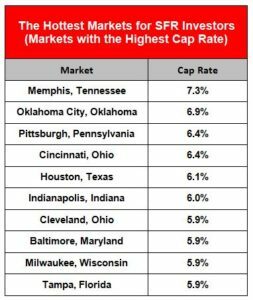 A new report from HomeUnion, looks at the best and worst markets for Single Family Rentals (SFRs). The most favorable markets were: Memphis, TN (7.3%); Oklahoma City, OK (6.9%); Pittsburgh, PA (6.4%); Cincinnati, OH (6.4%) and Houston, TX (6.1%). The Bay Area – San Francisco and San Jose – both at 2.7% – topped the least attractive markets followed closely by Orange County and Los Angeles in Southern California. Many investors obtain loans for SFRs so they can purchase more than one property. Colony American Finance loans acquisition lines for new purchases. We also have 5 and 10-year fixed rate term loans that provide long term financing solutions for stabilized rental properties.